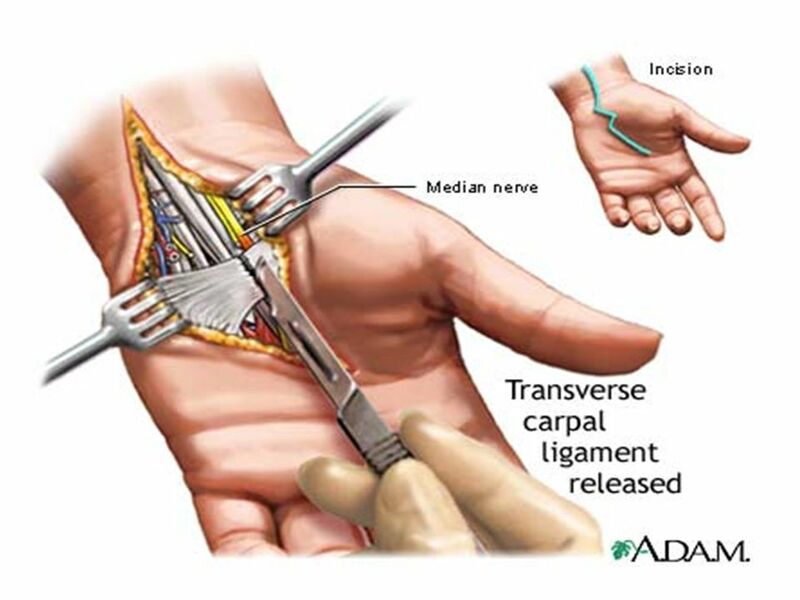 2 Carpal Tunnel Release Generally, an incision is made over the area of tendon attachment, the tendon tissue is cut away from the bone, allowing the tendon to relax or pull back towards the muscle belly. 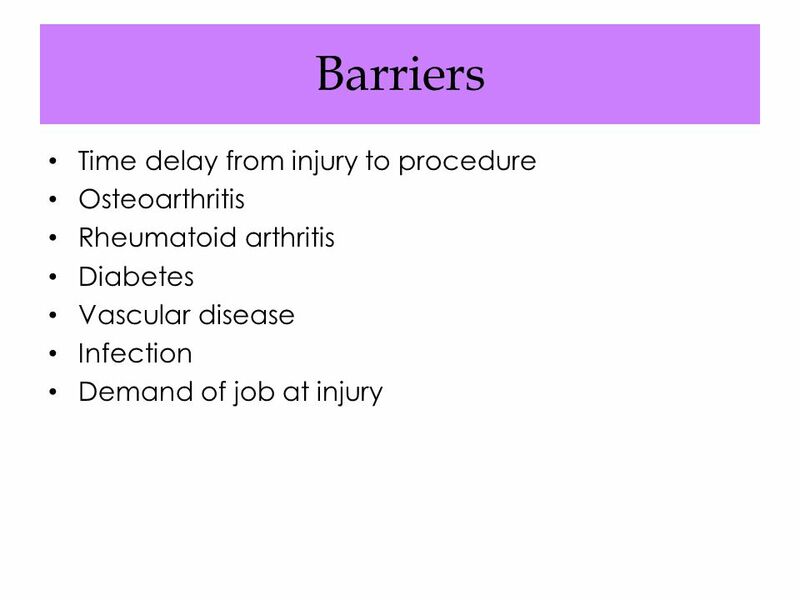 It may not be necessary to release the entire tendon to decrease tension on the muscle tendon unit. If the tendon is to be reattached (transposed) to another location, the incision is larger and the procedure more complicated. 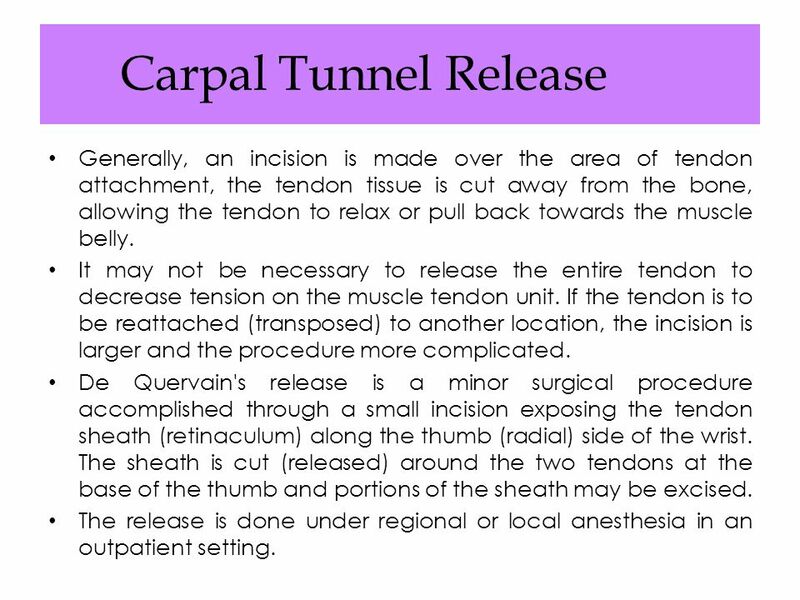 De Quervain's release is a minor surgical procedure accomplished through a small incision exposing the tendon sheath (retinaculum) along the thumb (radial) side of the wrist. The sheath is cut (released) around the two tendons at the base of the thumb and portions of the sheath may be excised. The release is done under regional or local anesthesia in an outpatient setting. 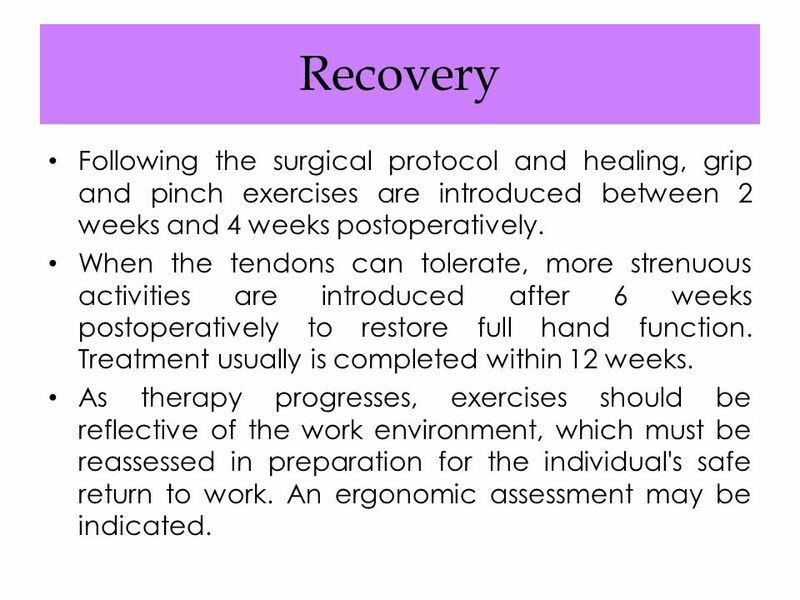 4 Recovery Following the surgical protocol and healing, grip and pinch exercises are introduced between 2 weeks and 4 weeks postoperatively. When the tendons can tolerate, more strenuous activities are introduced after 6 weeks postoperatively to restore full hand function. 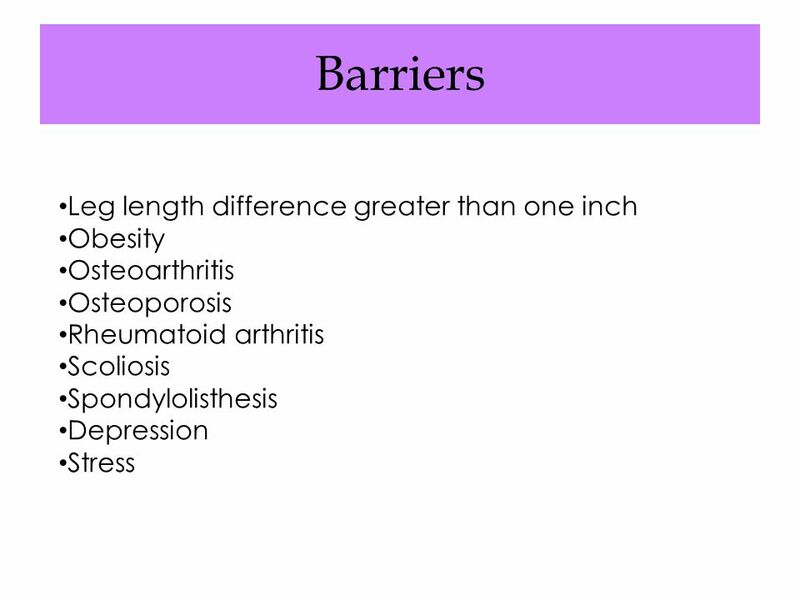 Treatment usually is completed within 12 weeks. 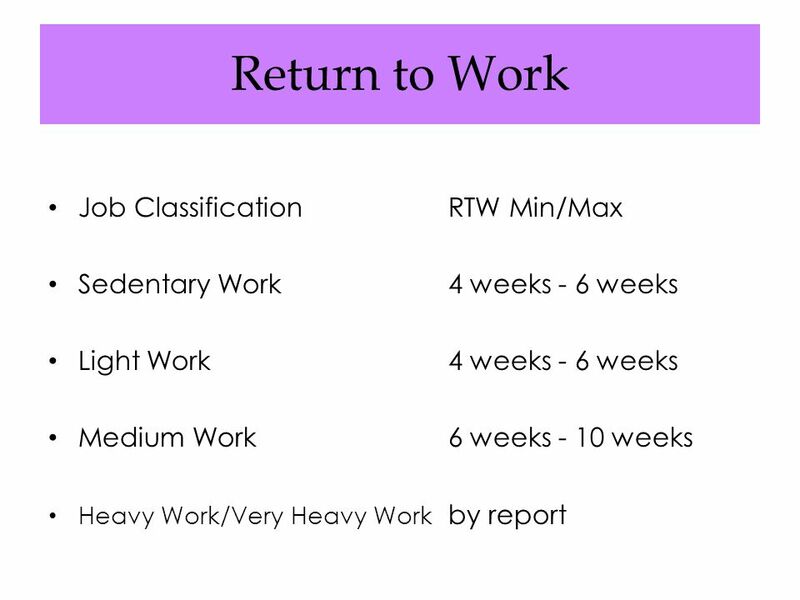 As therapy progresses, exercises should be reflective of the work environment, which must be reassessed in preparation for the individual's safe return to work. An ergonomic assessment may be indicated. 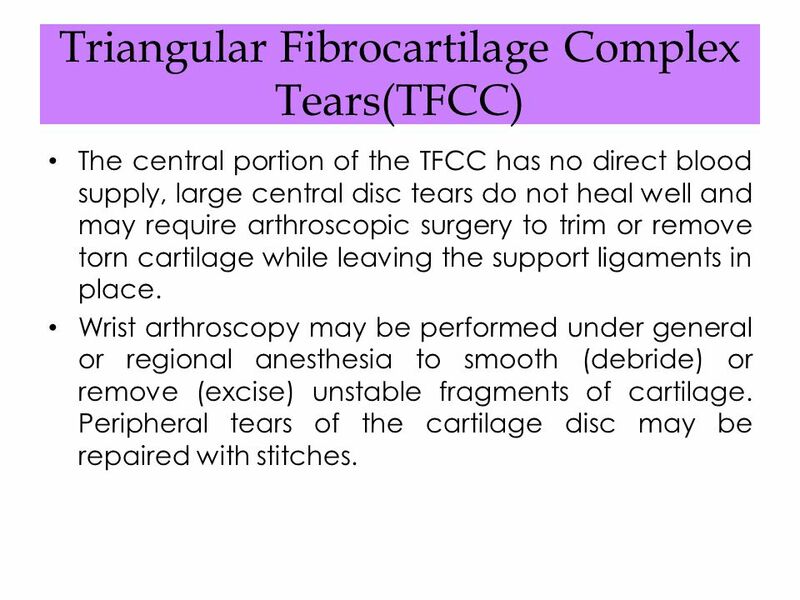 The central portion of the TFCC has no direct blood supply, large central disc tears do not heal well and may require arthroscopic surgery to trim or remove torn cartilage while leaving the support ligaments in place. Wrist arthroscopy may be performed under general or regional anesthesia to smooth (debride) or remove (excise) unstable fragments of cartilage. Peripheral tears of the cartilage disc may be repaired with stitches. 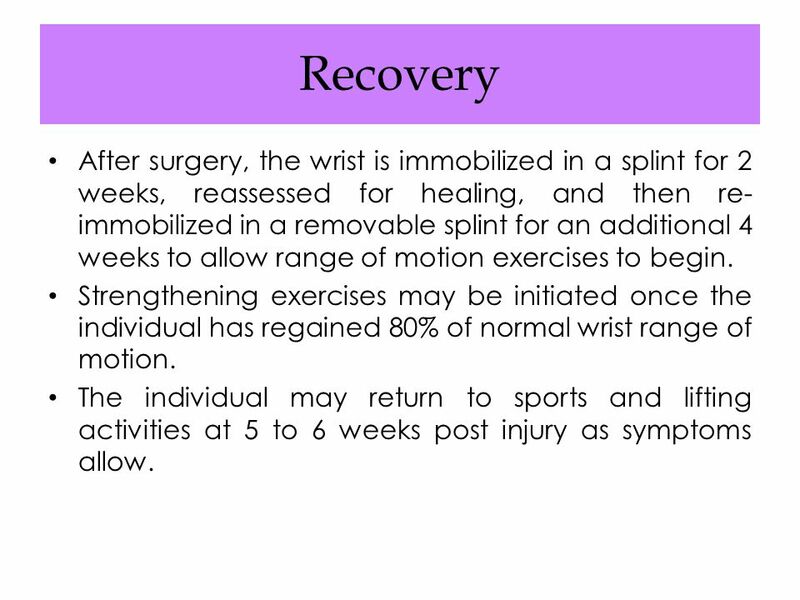 8 Recovery After surgery, the wrist is immobilized in a splint for 2 weeks, reassessed for healing, and then re-immobilized in a removable splint for an additional 4 weeks to allow range of motion exercises to begin. Strengthening exercises may be initiated once the individual has regained 80% of normal wrist range of motion. 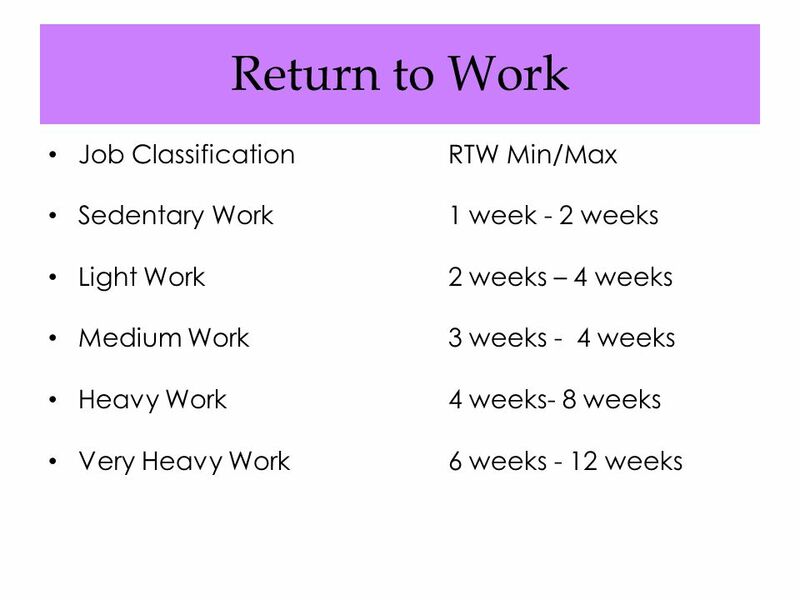 The individual may return to sports and lifting activities at 5 to 6 weeks post injury as symptoms allow. 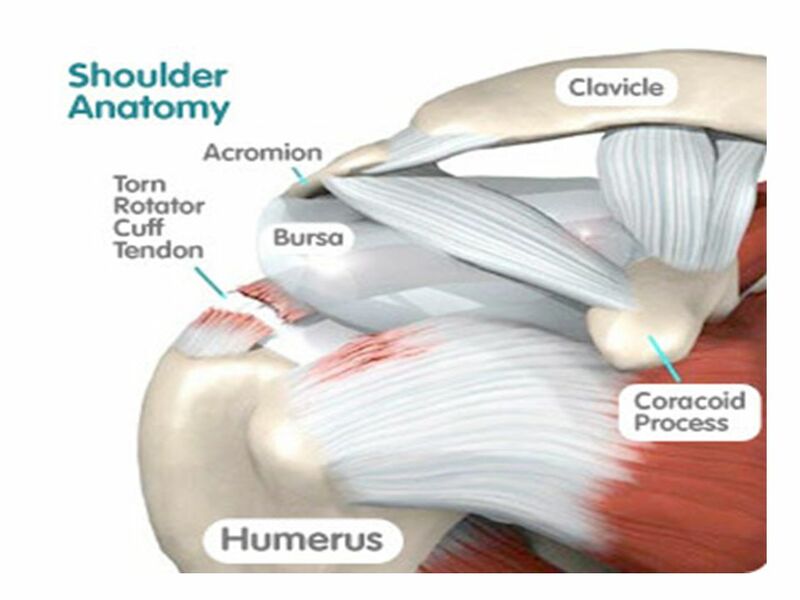 Several different surgical procedures are used in repairing the rotator cuff. One procedure involves smoothing (debriding) the ragged edges of the torn tendon and suturing the tissue edges together. 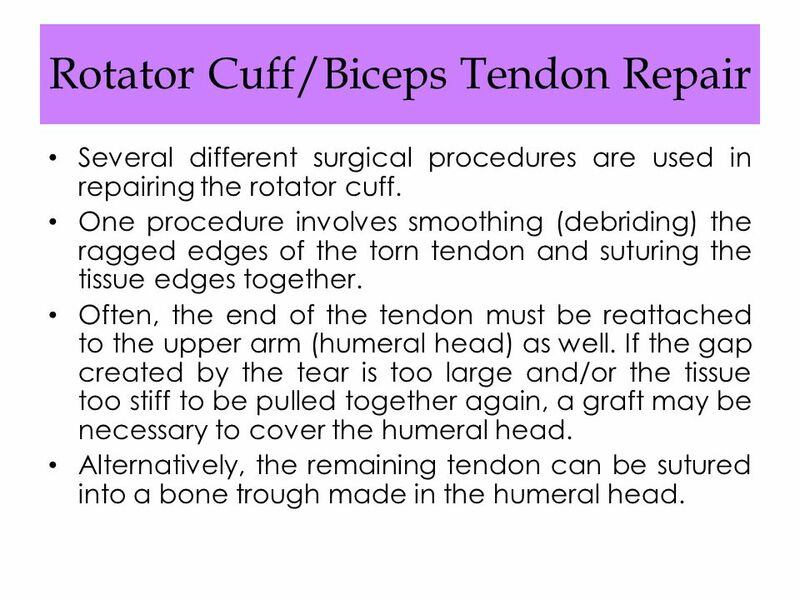 Often, the end of the tendon must be reattached to the upper arm (humeral head) as well. If the gap created by the tear is too large and/or the tissue too stiff to be pulled together again, a graft may be necessary to cover the humeral head. 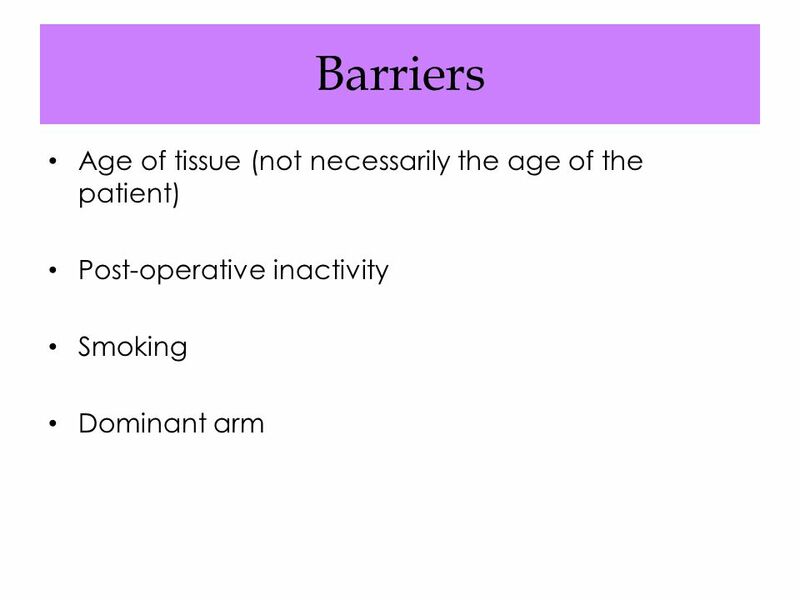 Alternatively, the remaining tendon can be sutured into a bone trough made in the humeral head. 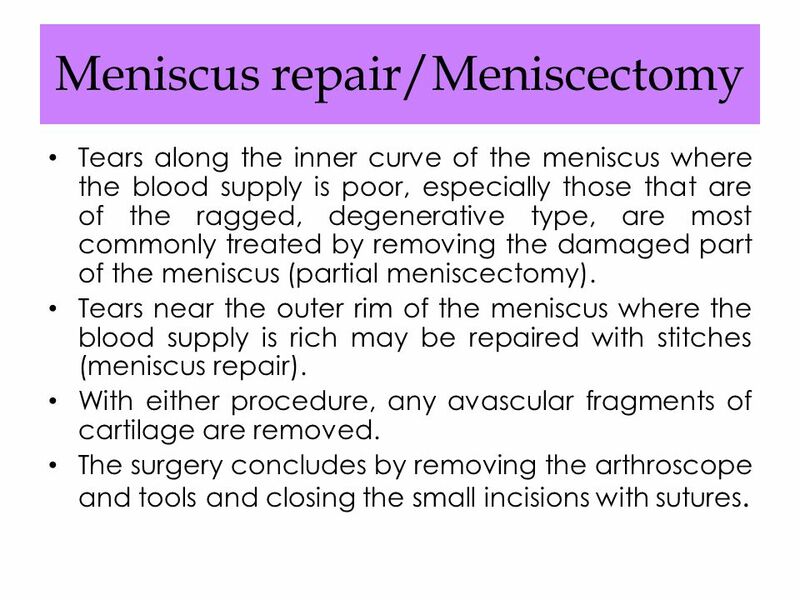 Tears along the inner curve of the meniscus where the blood supply is poor, especially those that are of the ragged, degenerative type, are most commonly treated by removing the damaged part of the meniscus (partial meniscectomy). Tears near the outer rim of the meniscus where the blood supply is rich may be repaired with stitches (meniscus repair). With either procedure, any avascular fragments of cartilage are removed. 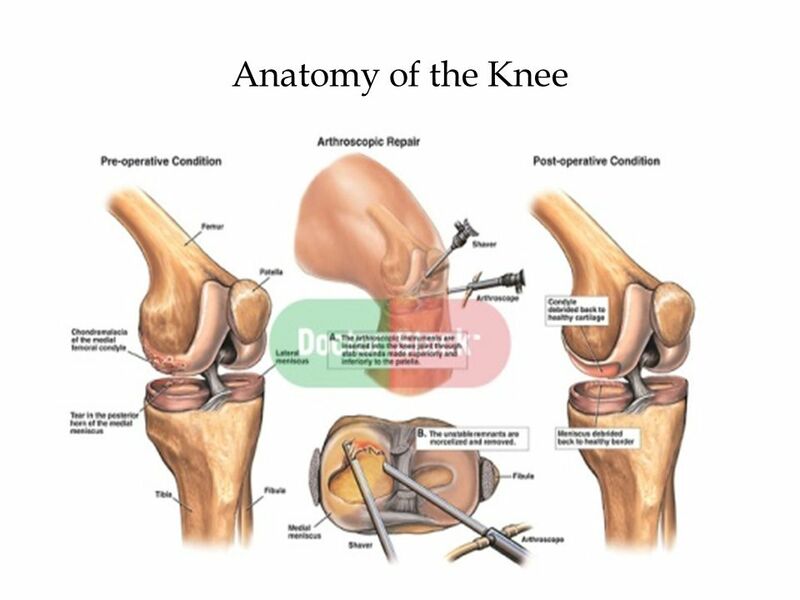 The surgery concludes by removing the arthroscope and tools and closing the small incisions with sutures. 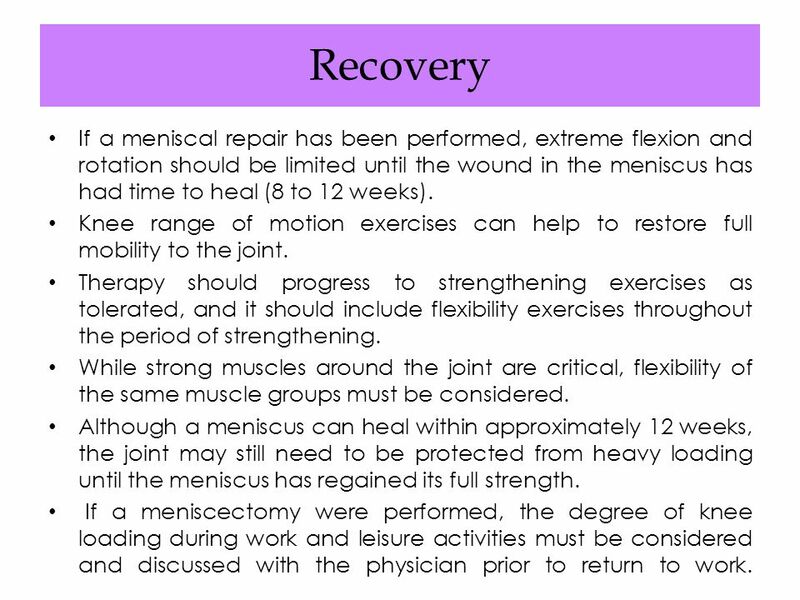 19 Recovery If a meniscal repair has been performed, extreme flexion and rotation should be limited until the wound in the meniscus has had time to heal (8 to 12 weeks). Knee range of motion exercises can help to restore full mobility to the joint. Therapy should progress to strengthening exercises as tolerated, and it should include flexibility exercises throughout the period of strengthening. 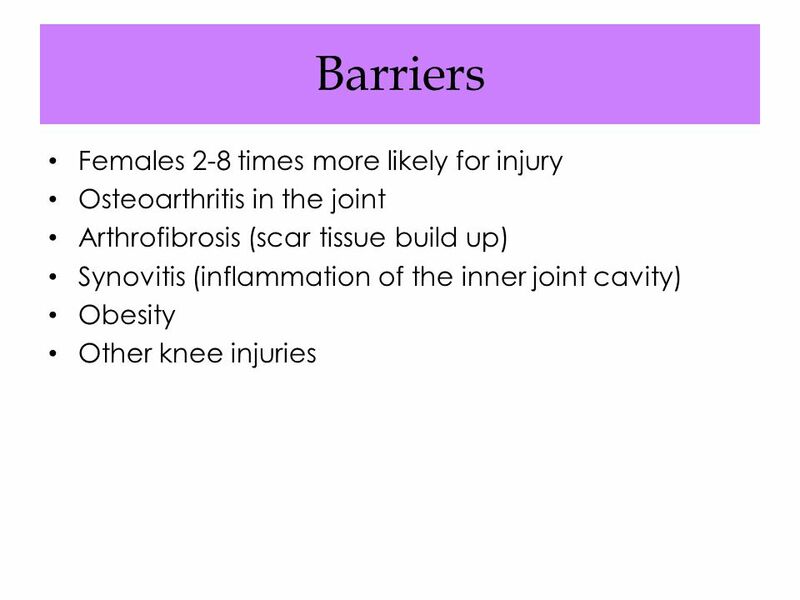 While strong muscles around the joint are critical, flexibility of the same muscle groups must be considered. 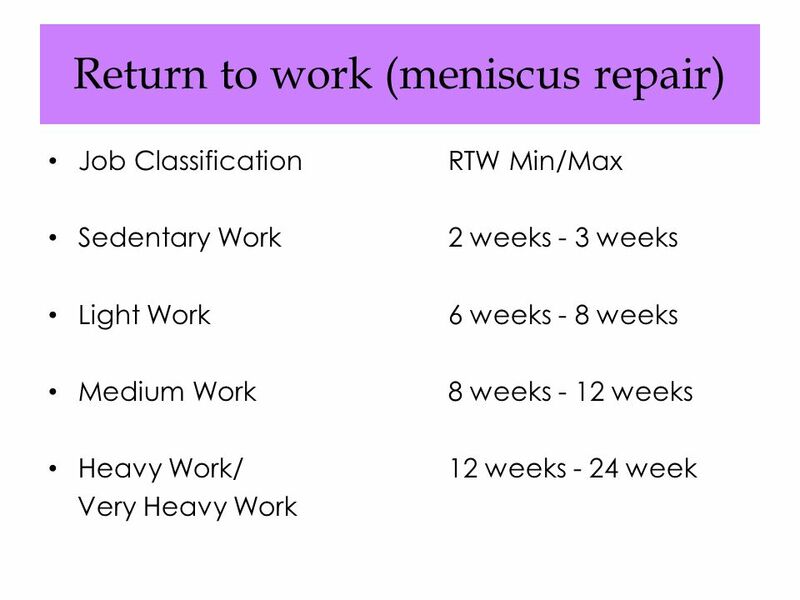 Although a meniscus can heal within approximately 12 weeks, the joint may still need to be protected from heavy loading until the meniscus has regained its full strength. 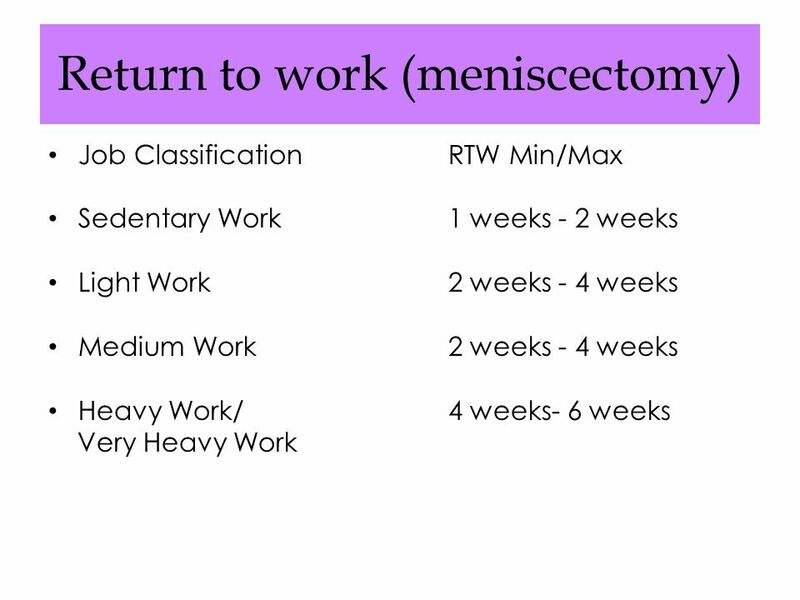 If a meniscectomy were performed, the degree of knee loading during work and leisure activities must be considered and discussed with the physician prior to return to work. The ligament is reconstructed by taking a piece of tendon from a different part of the body or from a donor and connecting it to the shinbone and thighbone. 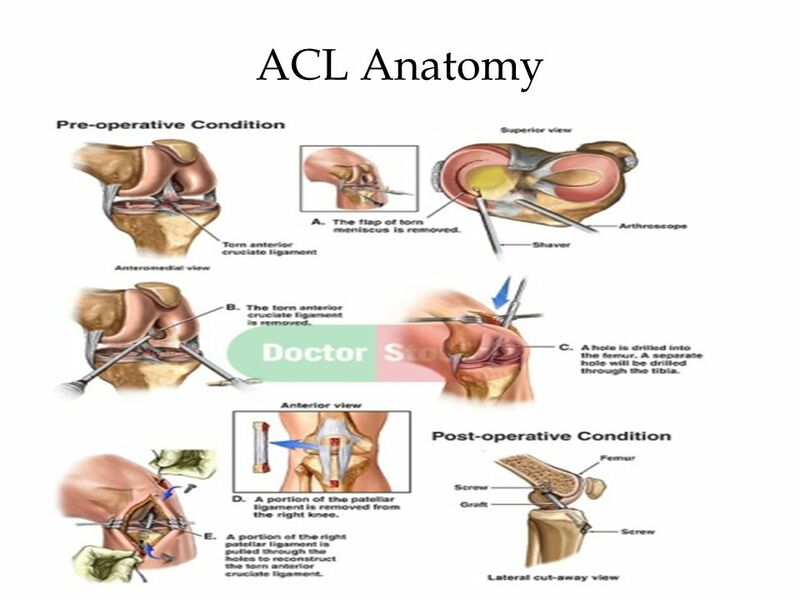 Although there are different methods for ACL reconstruction, they all involve the same basic procedure. 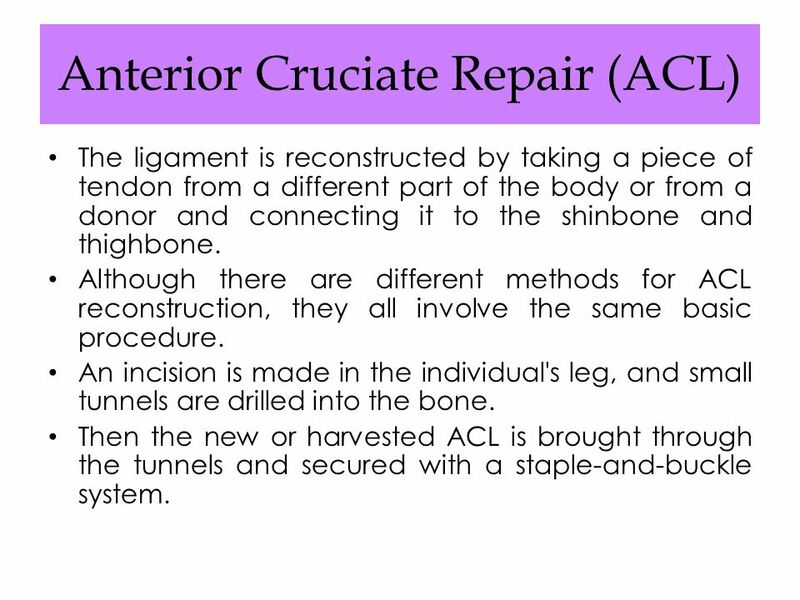 An incision is made in the individual's leg, and small tunnels are drilled into the bone. Then the new or harvested ACL is brought through the tunnels and secured with a staple-and-buckle system. 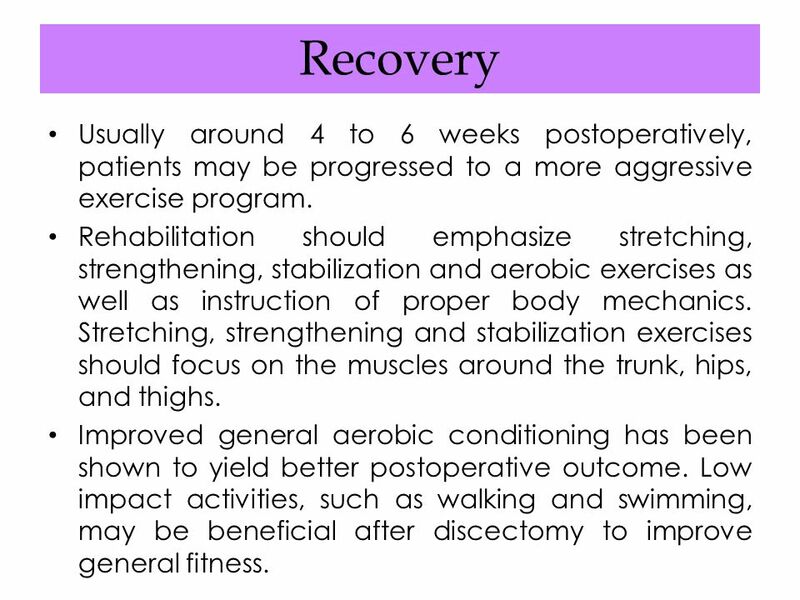 25 Recovery Rehabilitation, requiring months of intense exercise, is recommended for successful recovery from a surgical repair of the anterior cruciate ligament. 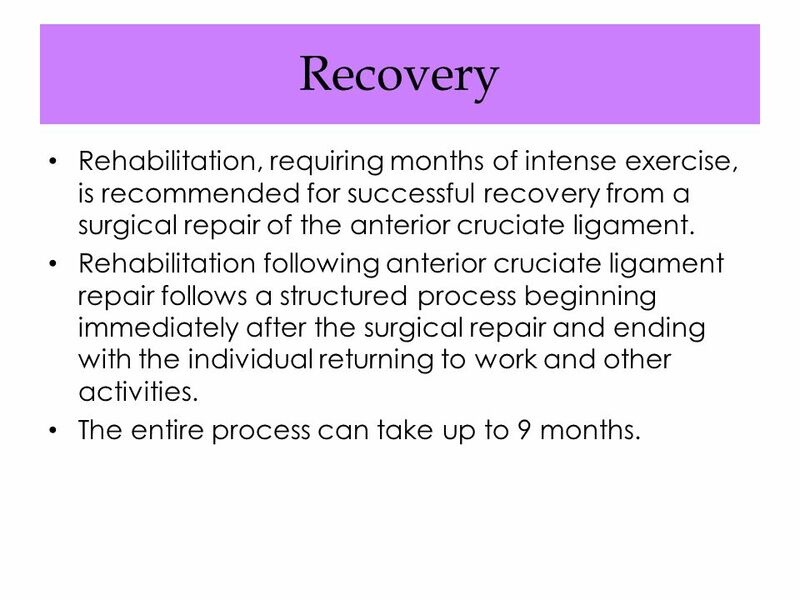 Rehabilitation following anterior cruciate ligament repair follows a structured process beginning immediately after the surgical repair and ending with the individual returning to work and other activities. 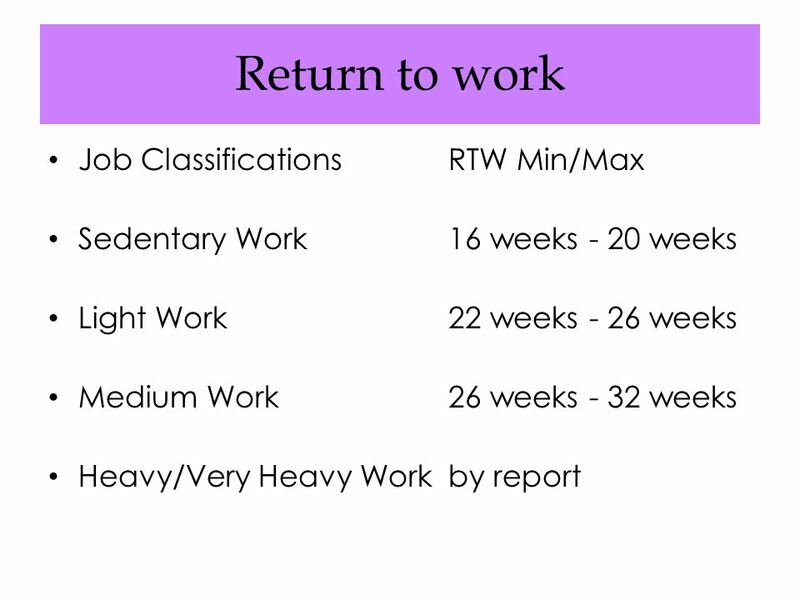 The entire process can take up to 9 months. 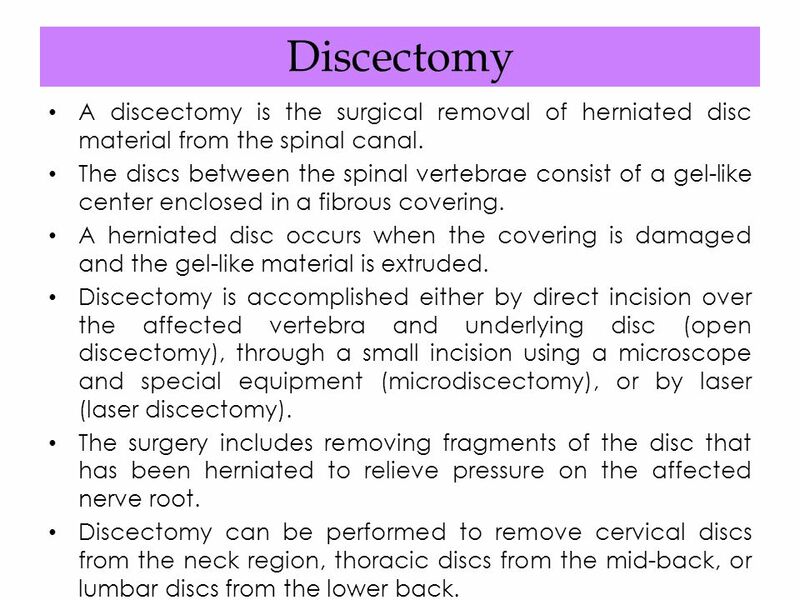 28 Discectomy A discectomy is the surgical removal of herniated disc material from the spinal canal. 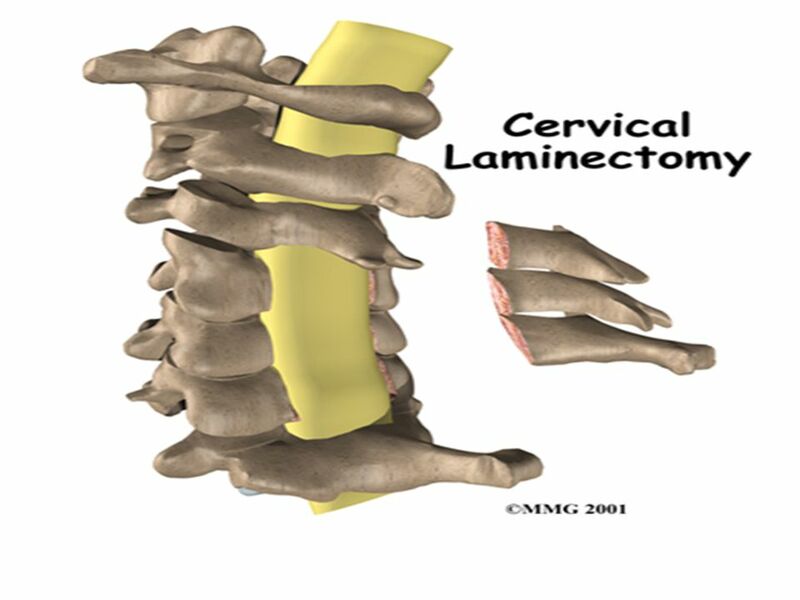 The discs between the spinal vertebrae consist of a gel-like center enclosed in a fibrous covering. A herniated disc occurs when the covering is damaged and the gel-like material is extruded. 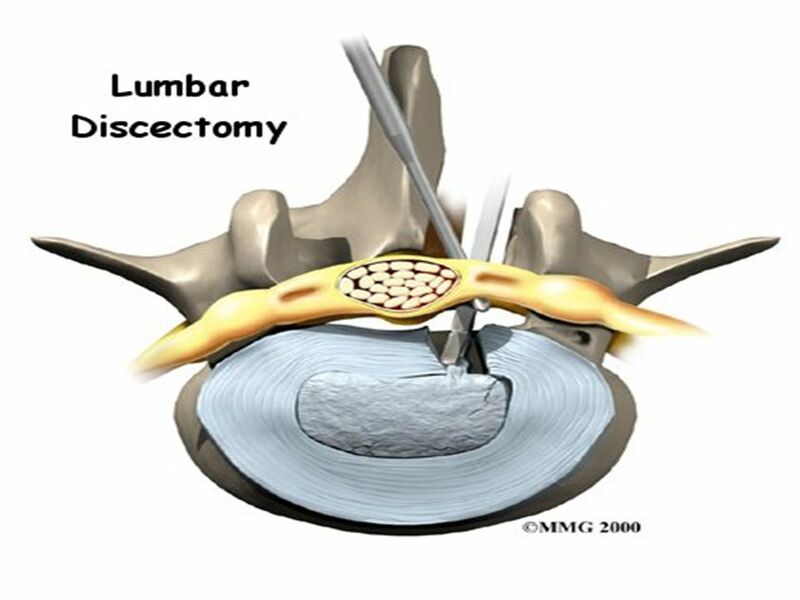 Discectomy is accomplished either by direct incision over the affected vertebra and underlying disc (open discectomy), through a small incision using a microscope and special equipment (microdiscectomy), or by laser (laser discectomy). The surgery includes removing fragments of the disc that has been herniated to relieve pressure on the affected nerve root. Discectomy can be performed to remove cervical discs from the neck region, thoracic discs from the mid-back, or lumbar discs from the lower back. 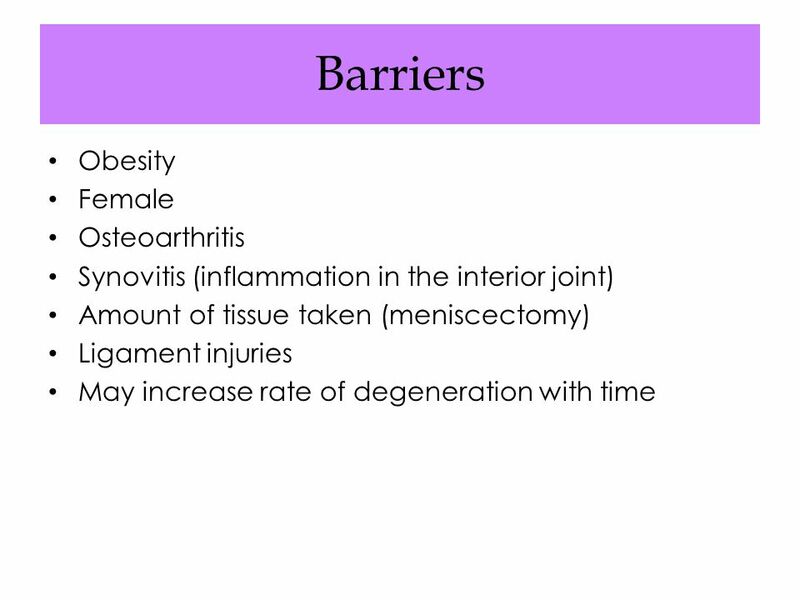 30 Recovery Usually around 4 to 6 weeks postoperatively, patients may be progressed to a more aggressive exercise program. Rehabilitation should emphasize stretching, strengthening, stabilization and aerobic exercises as well as instruction of proper body mechanics. Stretching, strengthening and stabilization exercises should focus on the muscles around the trunk, hips, and thighs. Improved general aerobic conditioning has been shown to yield better postoperative outcome. Low impact activities, such as walking and swimming, may be beneficial after discectomy to improve general fitness. 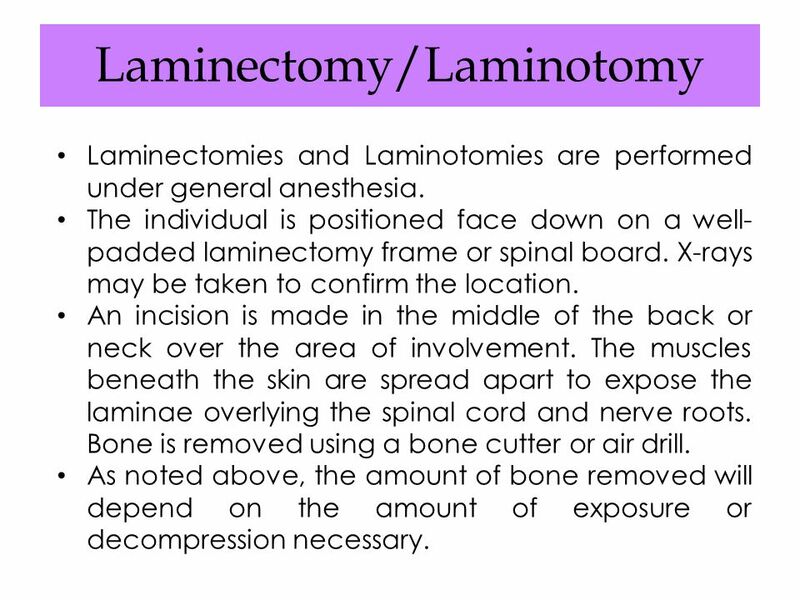 Laminectomies and Laminotomies are performed under general anesthesia. 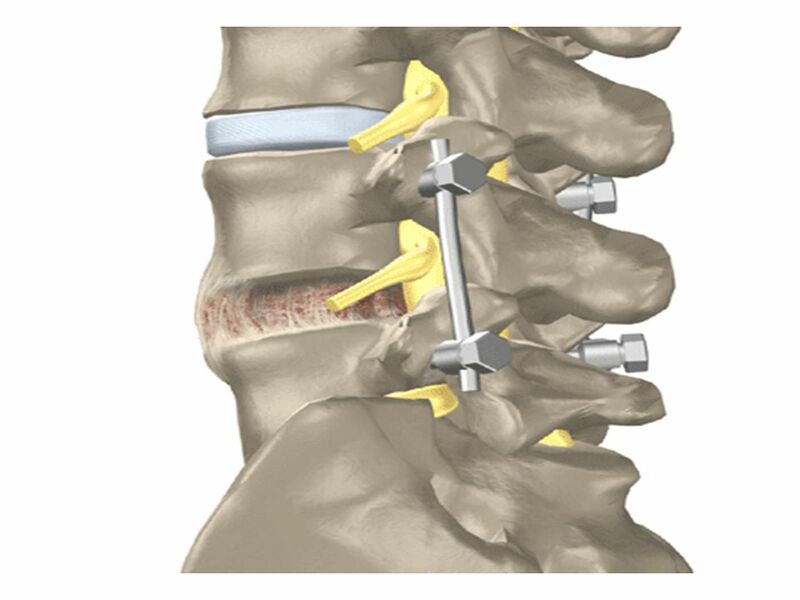 The individual is positioned face down on a well-padded laminectomy frame or spinal board. X-rays may be taken to confirm the location. An incision is made in the middle of the back or neck over the area of involvement. The muscles beneath the skin are spread apart to expose the laminae overlying the spinal cord and nerve roots. 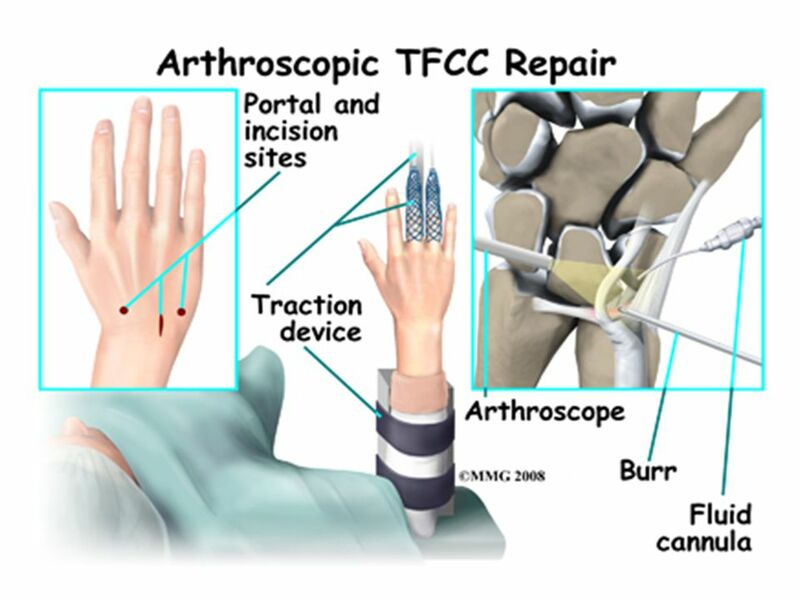 Bone is removed using a bone cutter or air drill. 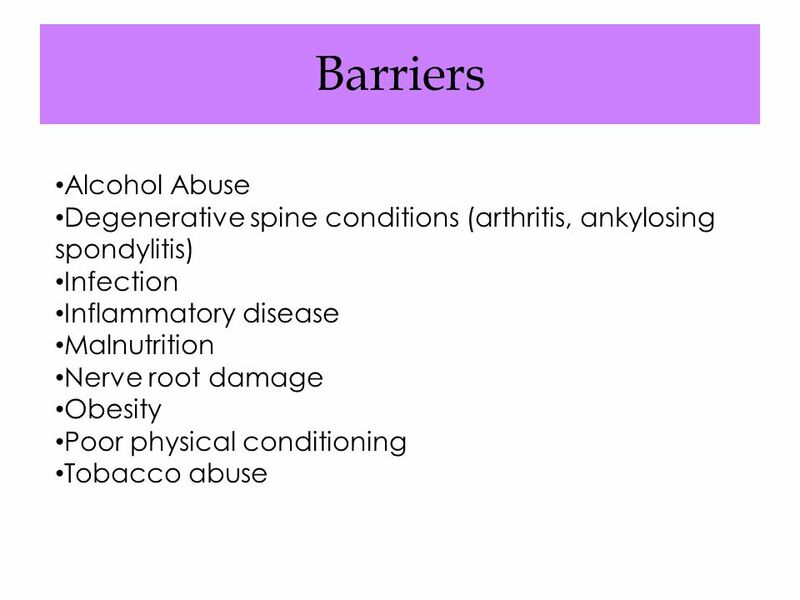 As noted above, the amount of bone removed will depend on the amount of exposure or decompression necessary. 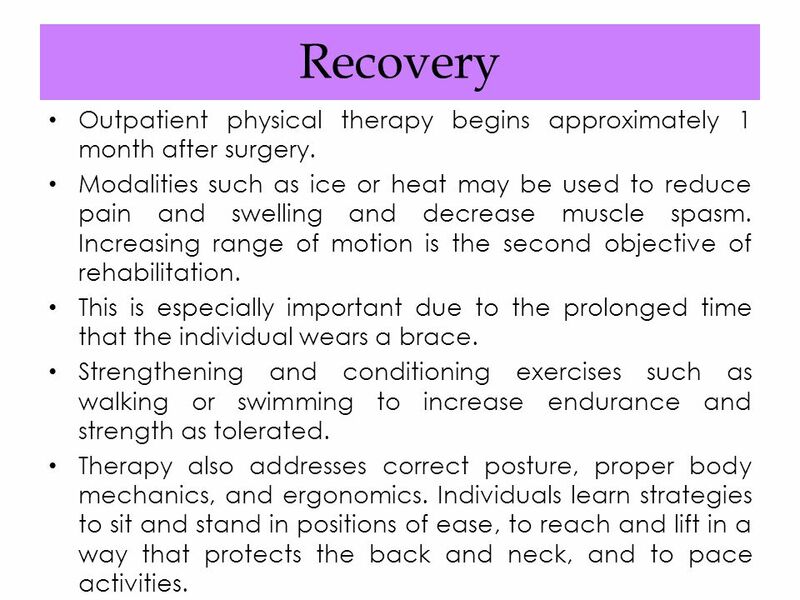 35 Recovery Outpatient physical therapy begins approximately 1 month after surgery. Modalities such as ice or heat may be used to reduce pain and swelling and decrease muscle spasm. 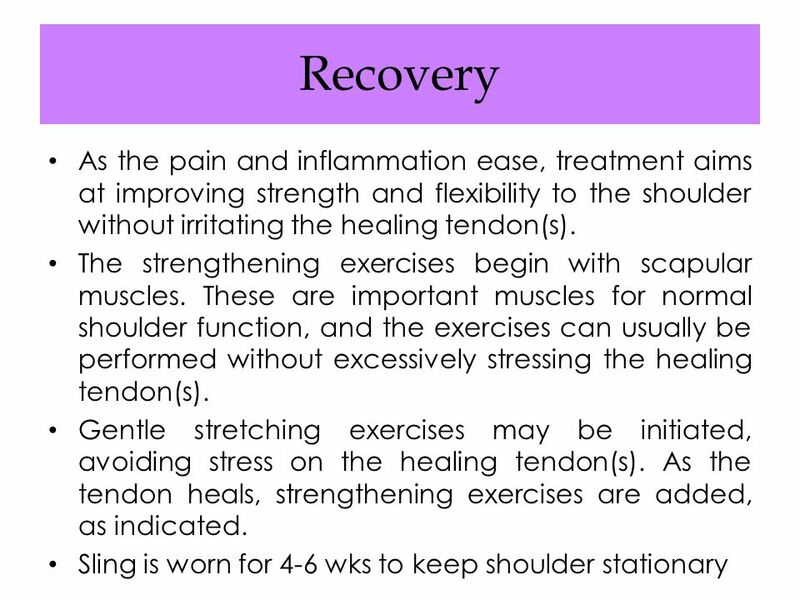 Increasing range of motion is the second objective of rehabilitation. This is especially important due to the prolonged time that the individual wears a brace. Strengthening and conditioning exercises such as walking or swimming to increase endurance and strength as tolerated. Therapy also addresses correct posture, proper body mechanics, and ergonomics. Individuals learn strategies to sit and stand in positions of ease, to reach and lift in a way that protects the back and neck, and to pace activities. 38 Spinal Fusion Spinal fusion is the surgical immobilization of two or more adjacent bones of the spinal column (vertebra). Multiple bones are fused or made to grow together to become one solid bone. For all types of spinal fusion, the segment of the spine is ultimately immobilized with a bone graft, which serves as a scaffold for new bone growth to create a bony union between two or more adjacent vertebrae. 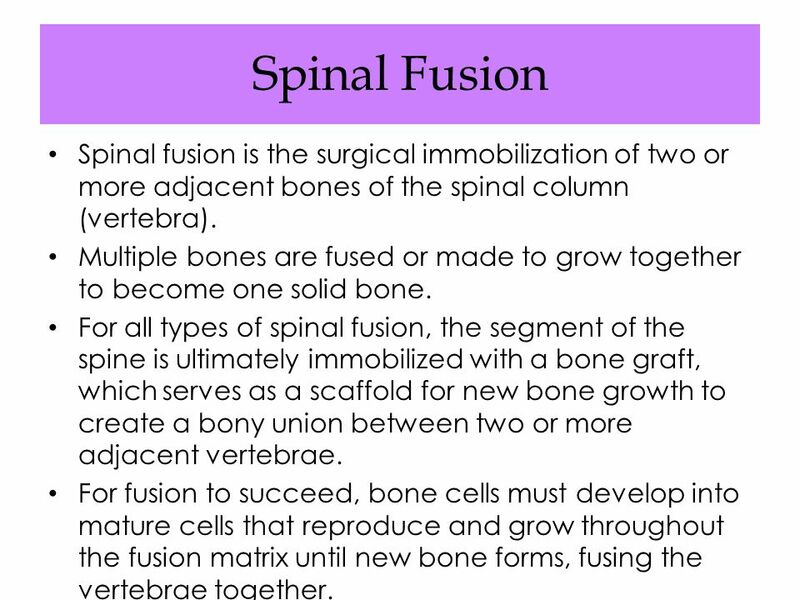 For fusion to succeed, bone cells must develop into mature cells that reproduce and grow throughout the fusion matrix until new bone forms, fusing the vertebrae together. 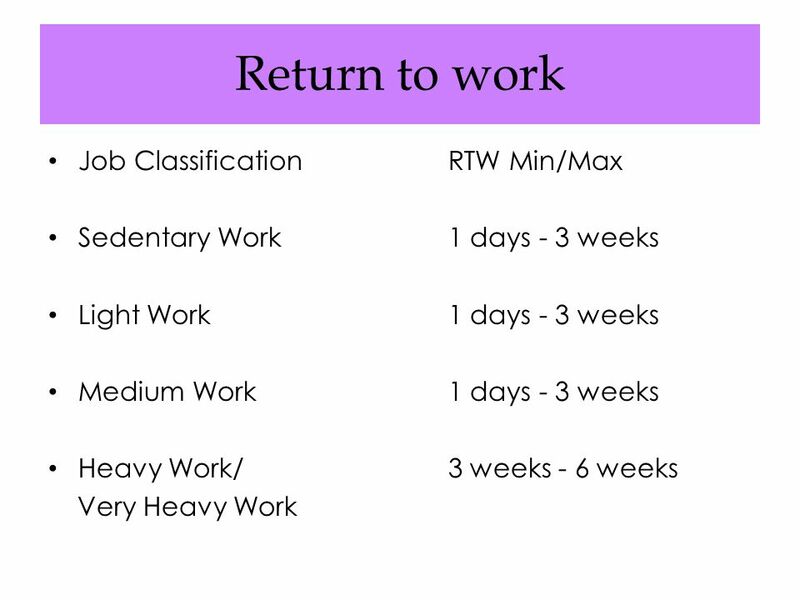 40 Recovery Approximately 4 to 6 weeks postoperatively, or when recommended by the surgeon, isometric training of the trunk muscles can be initiated. General conditioning exercises of the upper and lower extremities, and aerobic training are initiated and progressed as indicated. Activities that promote trunk flexion should be avoided until approved by the surgeon. Once trunk flexion is advised, then general trunk flexibility, strengthening, and endurance exercises can be taught and progressed as tolerated. 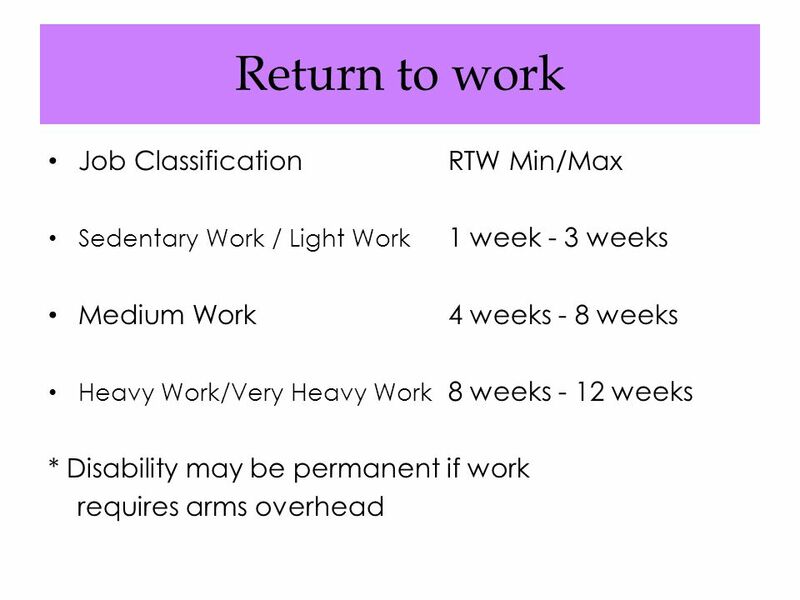 An ergonomic assessment may be beneficial to modify the workplace as needed and ensure the work status of the individual. 42 Steroid Injections An epidural steroid injection is performed to help reduce the inflammation and pain associated with nerve root compression. Nerve roots can be compressed by a herniated disc, spinal stenosis, and bone spurs. When the nerve is compressed it becomes inflamed. This can lead to pain, numbness, tingling or weakness along the course of the nerve. 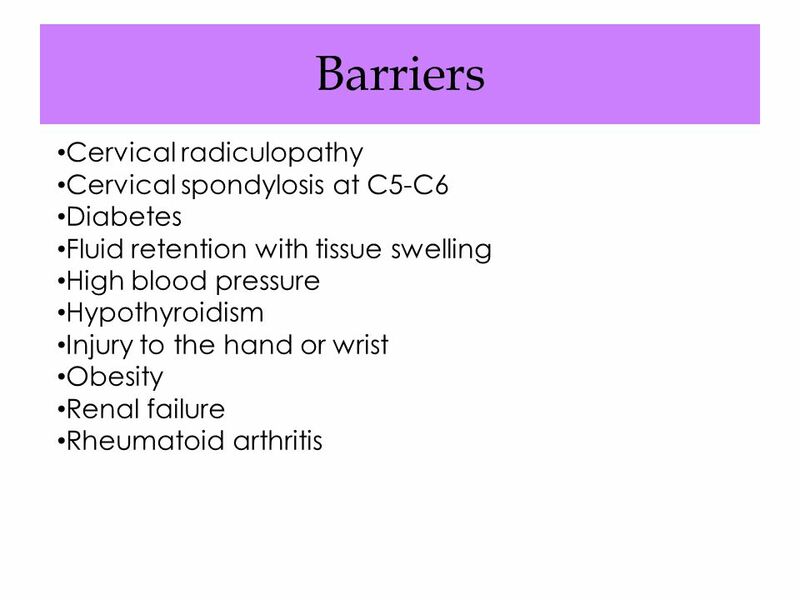 This is called radiculopathy. 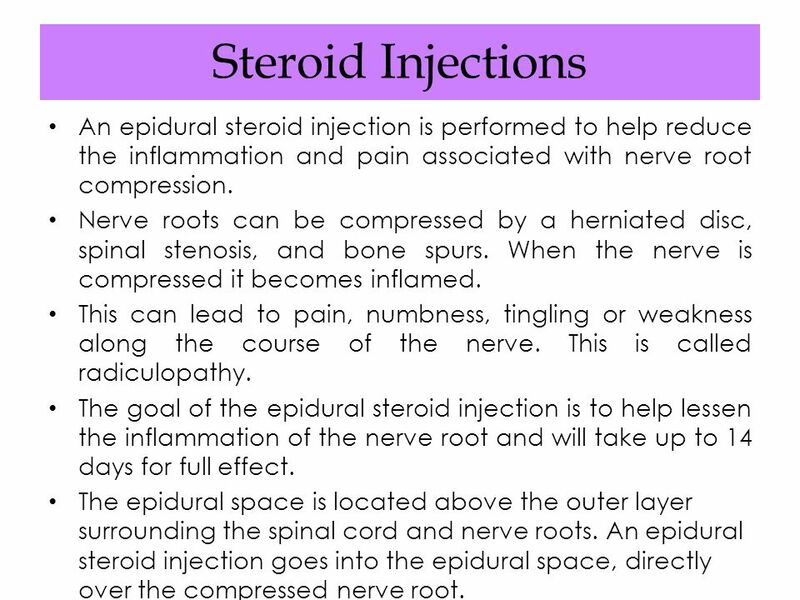 The goal of the epidural steroid injection is to help lessen the inflammation of the nerve root and will take up to 14 days for full effect. The epidural space is located above the outer layer surrounding the spinal cord and nerve roots. 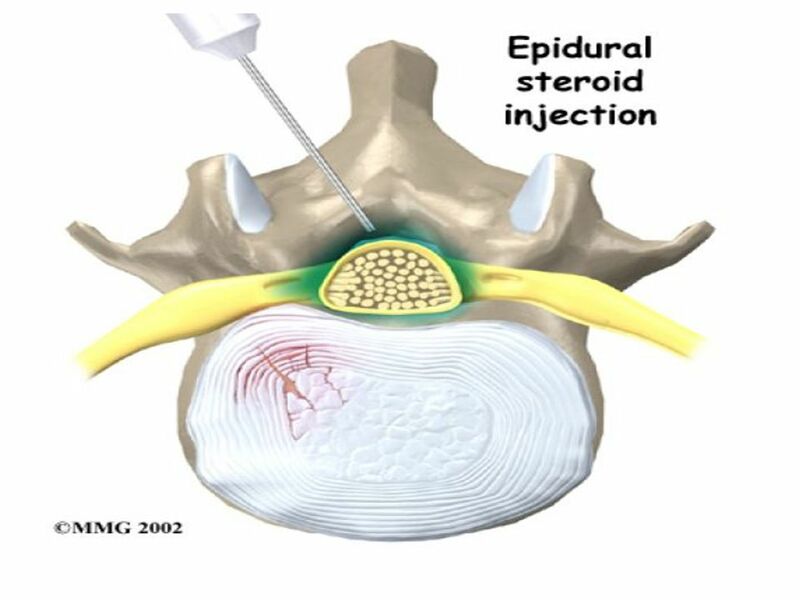 An epidural steroid injection goes into the epidural space, directly over the compressed nerve root. 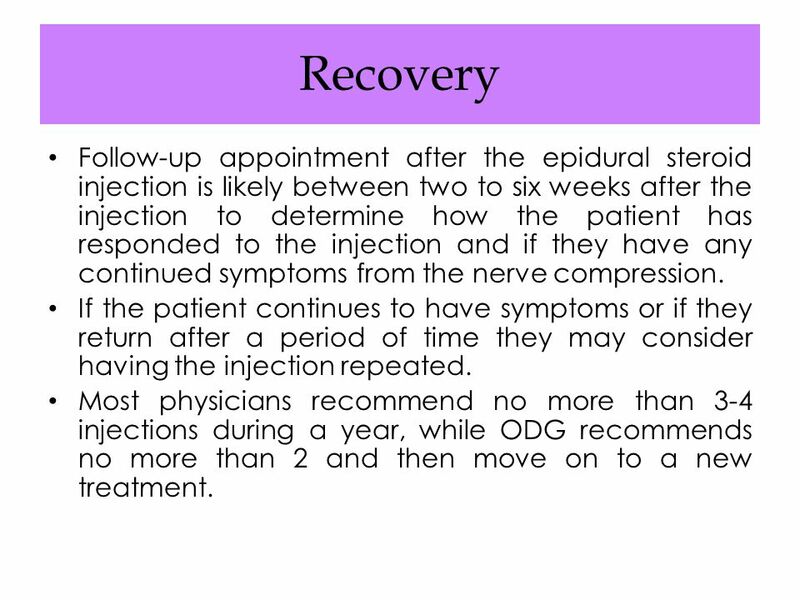 44 Recovery Follow-up appointment after the epidural steroid injection is likely between two to six weeks after the injection to determine how the patient has responded to the injection and if they have any continued symptoms from the nerve compression. If the patient continues to have symptoms or if they return after a period of time they may consider having the injection repeated. Most physicians recommend no more than 3-4 injections during a year, while ODG recommends no more than 2 and then move on to a new treatment. 47 Inguinal Hernia Surgical repair of an inguinal hernia consists of either an open or a closed surgical technique. The open technique consists of opening the inguinal canal, reducing the hernia, and reinforcing the floor of the inguinal canal with a synthetic mesh. With the closed technique, the surgeon uses a laparoscope to introduce the tools and mesh through puncture holes to reduce the herniation and reinforce the posterior wall of the inguinal canal. 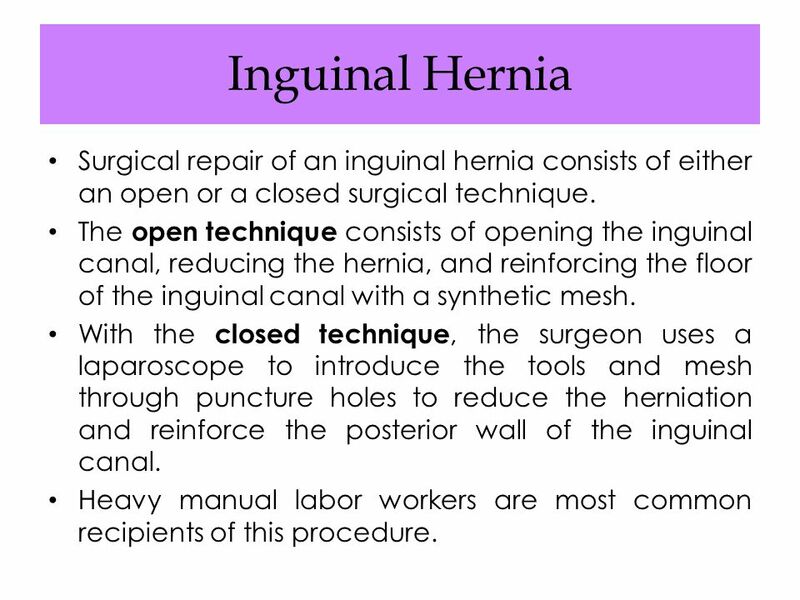 Heavy manual labor workers are most common recipients of this procedure. 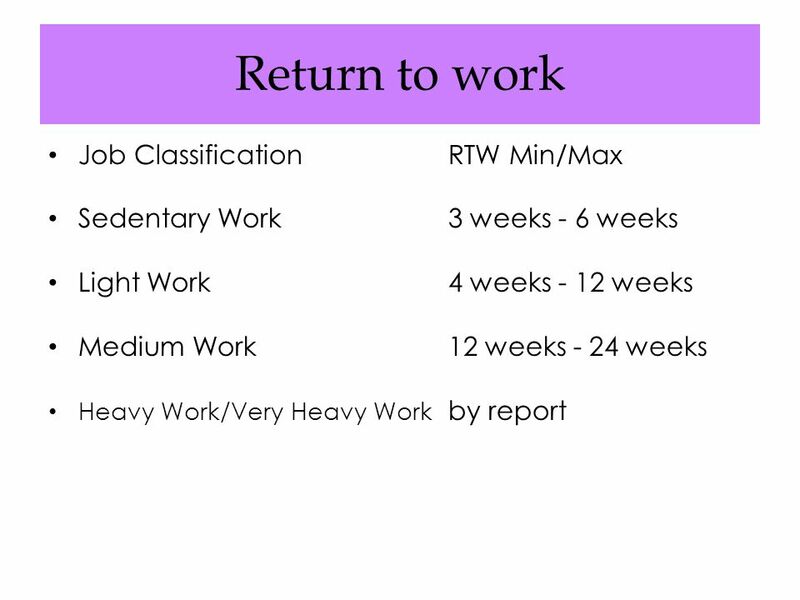 48 Recovery Follow up occurs 1 week after surgery with limited activities until that time. 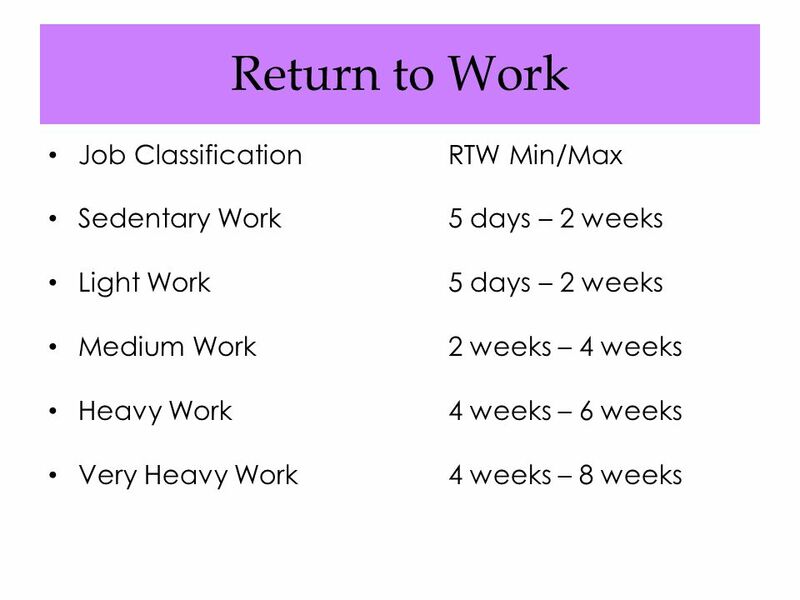 Avoid lifting more than 10 pounds for 4 weeks and excessive bending or twisting for 1-2 weeks following surgery. 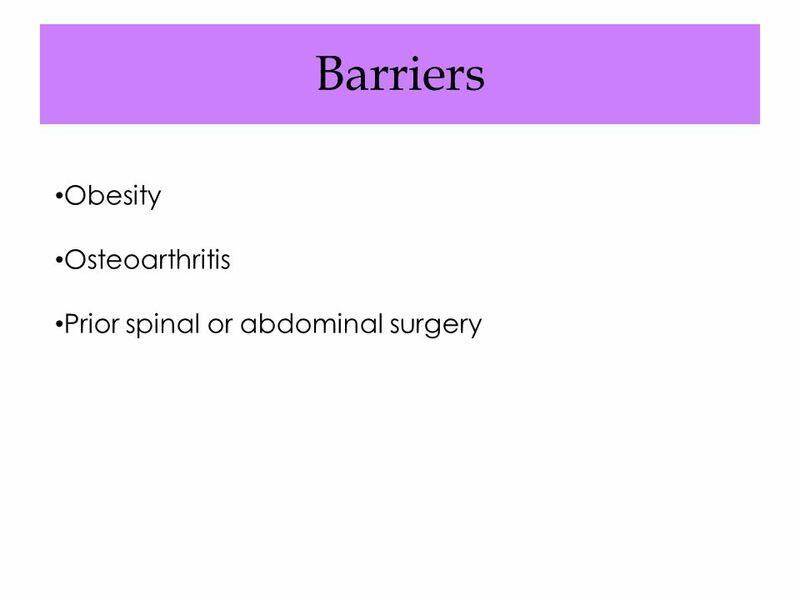 Walking is strongly encourage as soon as possible after procedure. Successful hernia repair is achieved by reducing factors that contribute pressure such as cough, constipation, and repairing the defect so that the incision line remains free of tension. 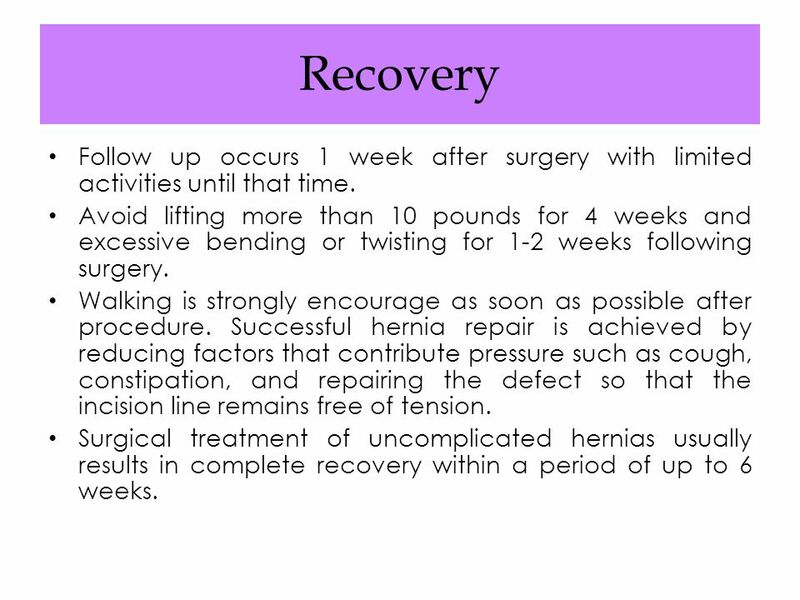 Surgical treatment of uncomplicated hernias usually results in complete recovery within a period of up to 6 weeks. 50 One more thing! Remember everyone copes with injury, illness and pain differently. 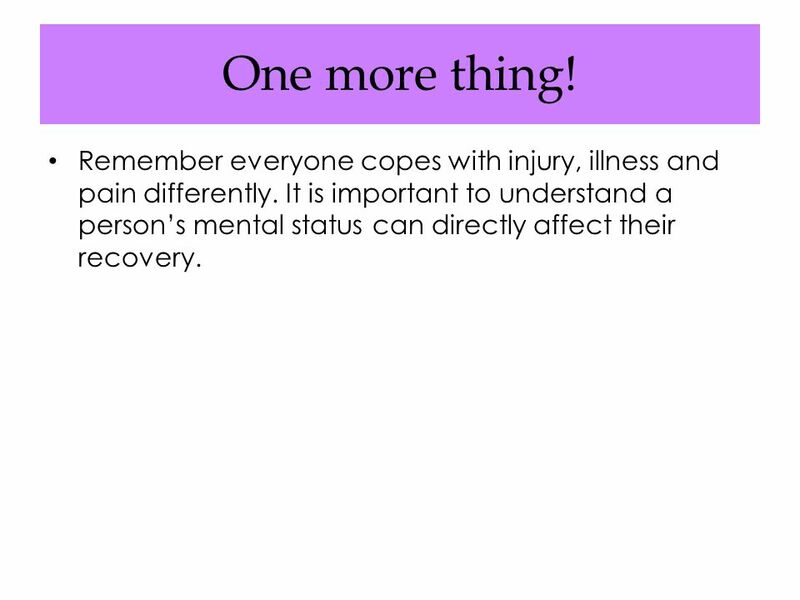 It is important to understand a person’s mental status can directly affect their recovery. 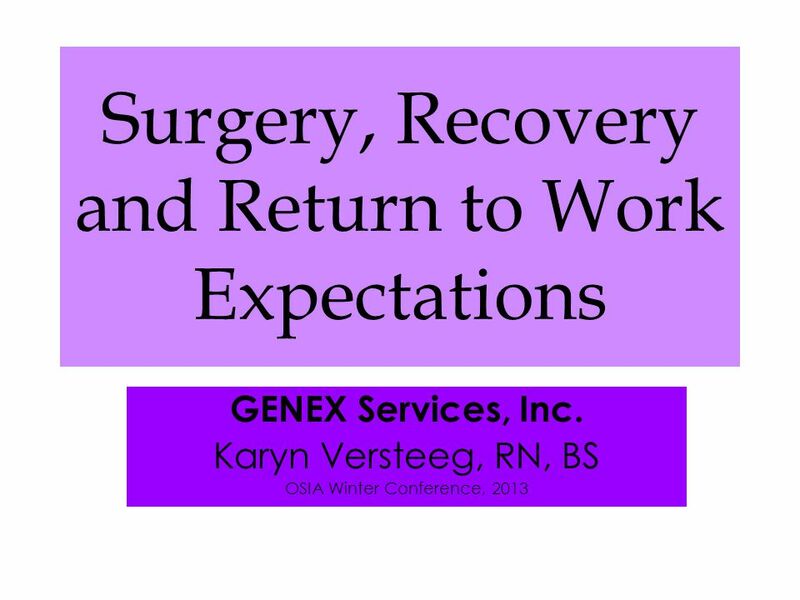 Download ppt "Surgery, Recovery and Return to Work Expectations"
M.P. Muldoon, M. D. Orthopedic Medical Group of San Diego. P OSTERIOR C RUCIATE L IGAMENT By; Maria Guzman. T HE P OSTERIOR C RUCIATE L IGAMENTS (PCL) Is one of a pair of ligaments that are found in the middle. Rehabilitation Following Rotator Cuff Repair Kolleen Shields MS, P.T Hawkeye Sports Medicine Symposium. Headaches The Migraine headache is unilateral pain (affecting one half of the head) and pulsating in nature, lasting from 4 to 72 hours; symptoms include. Bankart Lesion Thomas J Kovack DO. 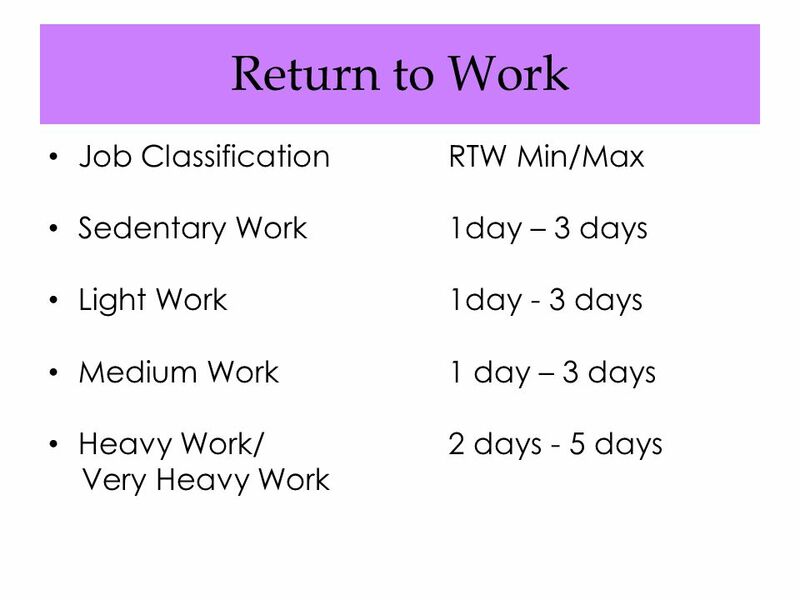 Ergonomics INSTRUCTOR’S NOTES: This presentation is designed to assist trainers conducting OSHA 10-hour. Copyright ©2012 Progressive Business Publications Back Safety. 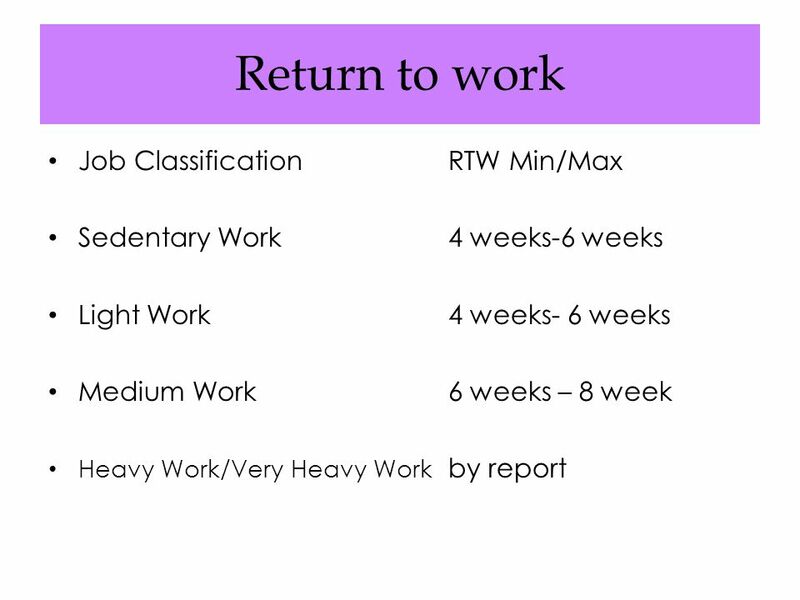 Lifting Lifting process is applied frequently by most of the people, so it’s very necessary to know the loads during lifting, include the weight of the. Structure of the Back The human back is an amazing mechanical device. It is strong enough to support our entire body yet supple and flexible enough to.